On June 1st, 2011 a devastating F3 Tornado struck western and central Massachusetts, leaving a 37 mile path of destruction in its wake. 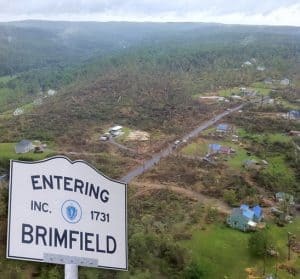 Much of the town of Brimfield was destroyed. Jonathan Hall was helping those affected by the storm in his role as a volunteer Paramedic. Over the next few days he worked for the Brimfield Ambulance Service helping local residents try to return to some level of normalcy after the destructive storm. Little did he know that not only would his work entail helping humans, but also help make a difference in the life of one little kitten. 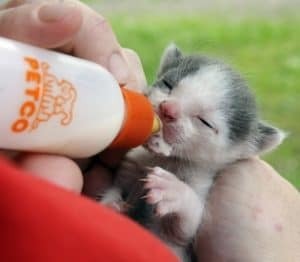 The day after the storm, a tree worker who was clearing roads found a tiny kitten in the brush and brought him to the fire station where Jonathan was working. 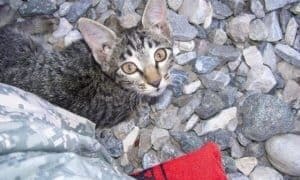 The kitten, who was obviously very young and only weighed six ounces, was cold and hungry. 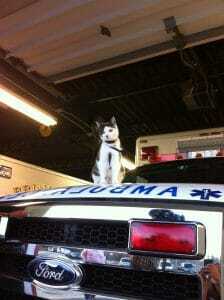 Jonathan and other EMS personnel cared for Toto throughout the day. But, since Jonathan’s own home had been damaged in the storm, he was unable to keep the kitten. He took the tiny black and white baby to the Animal Rescue League of Boston who were in town helping out with some large animals trapped in a barn. 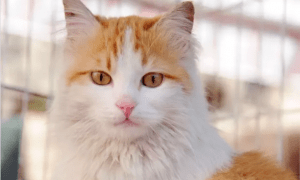 Despite being critically ill from his ordeal, the kitten was nursed back to health. With that in mind, Jonathan teamed up with Vermont artist Carol Rusicka to write an illustrated children’s book titled Toto The Tornado Kitten which follows the tiny kitten’s journey from the forest until he finds his new adopted home. 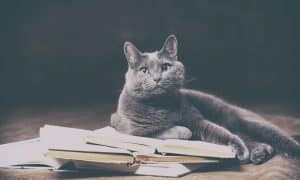 Toto’s story touched us, and apparently we weren’t the only ones. Jonathan told us, “I thought it would sell a few copies but it took off and I have been able to raise over $55,000 for the Animal Rescue League as well as other local shelters!” In fact, the book sold over 10,000 copies and proceeds helped purchase a new rescue vehicle for the Animal Rescue League. view his “Totographs”. “He loves to travel with me and meet new people” says Hall. “We are pretty sure he thinks he is a dog!” He always travels on a leash and loves to stroll into a new place and just flop on the floor announcing his arrival. 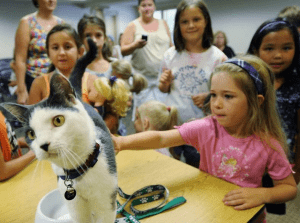 Toto’s gentle and kind nature become evident when he visits with children, the disabled, and the elderly giving out plenty of nose nuzzles, and being petted by fans both young and old. that he should write a book all about the various places they travel together, which is exactly what he did. “In the story he visits the bank” says Jonathan, “and often you can stop by the Country Bank in Brimfield and see him hanging out – just like the new book!” Hall reports that his days off from working on the ambulance are filled with Toto events of all kinds, including even once speaking at a regional weather forecaster’s conference. As with the first book, 100% of the proceeds from the book go towards funding the Animal Rescue League of Boston rescue services team as well as the Thomas J. O’Connor shelter in Springfield which helped out a number of local animals following the 2011 storm. 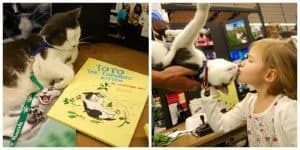 Toto’s books are available online at the TotoTheTornadoKitten.com, and you can follow his adventures at his Facebook page to see where he will be appearing next – and maybe even visit this special cat in person!